Feeling miserable, fed-up, and hopeless is very common in day to day life, either at home or workplace. However, these feelings are short lived and do not have a long term impact on our general well being. On the contrary, in case of depression, these negative feelings do not subside and keep building up for weeks or months. How does one recognize that one is suffering from depression? There may or may not be an obvious reason for becoming depressed. Usually, a combination of the following factors results in depression. 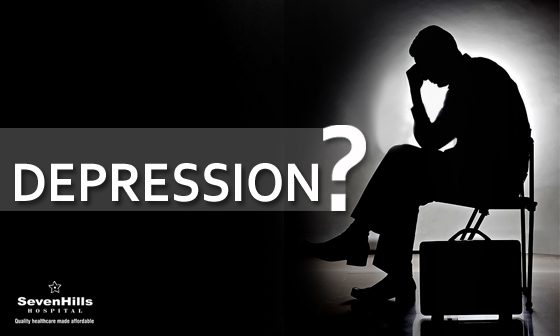 What is the mechanism of depression? The combination of the above mentioned factors result in imbalance of serotonin in the brain which is the main chemical responsible for keeping our mood normal. Depression can run in families. If you have one parent who has become severely depressed; you are about 8 times likely to become depressed yourself. lsn’t depression just a form of weakness? People think you have just “given in”, as if you have a choice. The fact is that there comes a point when depression becomes an illness just like any other physical illness. It can also happen to the most determined people – even powerful personalities can experience deep depression.When feelings of depression are worse, increasing in severity, affecting ones work interests and family life and when one finds life is not worth living, one should seek help. People with depression can seek help from a psychiatrist who will assess the severity of the case and suggest the mode of treatment. The doctor may suggest talking therapy (counselling) or antidepressant medications. Patients on antidepressants do not develop craving for the medications. Also, they need not be taken in increasing amounts to be effective unlike habit forming drugs such as calm pose, nicotine and alcohol. Early recognition, early counseling and timely medical treatment can prevent a lot of suffering and also save lives. Do not hesitate to approach psychiatrist early, they make all the difference in transforming the depressed person.Patient and family members should know that treatment does exist and depression is treatable.